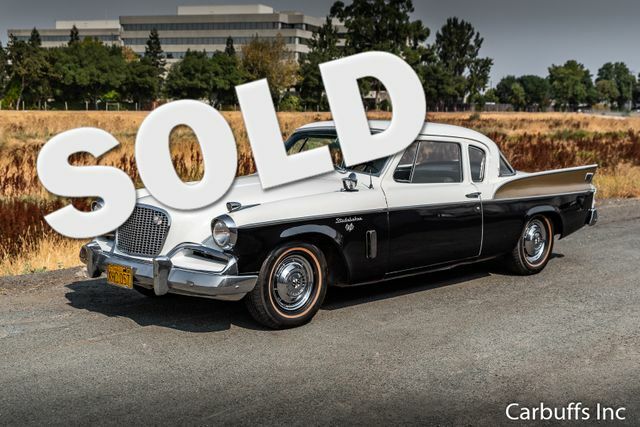 “This 1957 Studebaker Silver Hawk was with the original family until 2014 in the state of Washington. The following work has been done within the last year and 200 miles. All new radial tires, new front shocks, freshly rebuilt power steering pump, new water pump, air filter, fuel filter, oil change, and lube. Matthew and Sons Automotive in Vallejo performed a tune-up replacing points, plugs and condenser. They also did a compression test and found all 8 cylinders to test at 125-135 pounds. The engine does not smoke. They also removed all four wheels and found no leaks in wheel cylinders, and shoes and drums to be in good shape. 1956 California plates registered to the car with required 1957 registration sticker. Last 3 digits of license plate 057 tie in with the year 1957. Car starts quickly when driven regularly and travels at highway speeds of 65 mile per hour with no problem. Little to no rust. 289 engine does start and run good. Automatic transmission shifts good. Excellent styling. Restore while driving or leave as is and have a blast with it. Probably won’t park next to another one at the next car show.